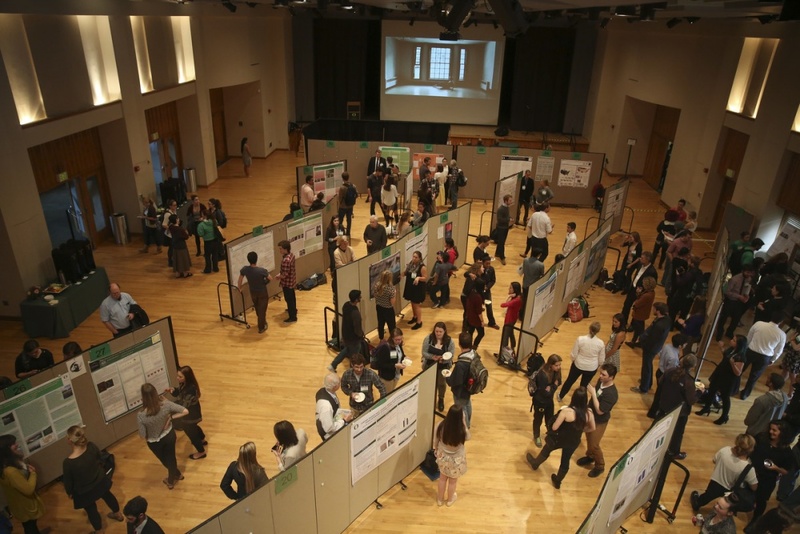 Hundreds of UO undergraduates will share their research and creative projects with the campus community at the UO Undergraduate Research Symposium this spring, and it’s not too late to join the lineup. To present your work, fill out an abstract submission form by Friday, March 16, at 11:59 p.m.
Undergraduates across all disciplines who are performing research as part of a course, thesis, major or laboratory can present at the symposium, which takes place on Thursday, May 17, in the Erb Memorial Union. Students also can present their performance or fine art projects. “The symposium defines research expansively and welcomes all forms of undergraduate creative work from the sciences, social sciences, arts, humanities, professional schools, study abroad, service learning and community-engaged projects,” said Josh Snodgrass, associate vice provost for undergraduate studies. Students can give an oral presentation or display a poster or creative work. They may present individually or in groups of up to six people, and research projects can be completed or ongoing. Abstracts should be under 250 words and written in accessible language. For assistance, students can attend workshops on abstract writing or reach out to ugresearch@uoregon.edu. Participants may have the opportunity to win one of several awards of up to $500, some given to projects of specific disciplines. The symposium is free and open to the public. Oral presentations and creative work sessions will happen throughout the day, and the event will conclude with a catered reception and awards ceremony from 5-5:30 p.m. and a poster session from 5:30-7:30 p.m. Last year’s event included nearly 300 presenters, representing 60 majors and eight colleges. Event organizers are also recruiting abstract reviewers, panel moderators and day-of volunteers. Abstract reviewers will receive their set of 15 abstracts by March 22 and will have through April 5 to complete their evaluations. Moderators will moderate oral presentation panels of four to five student presenters. Sign up for any of the positions on the symposium website by Friday, May 11, at 5 p.m.